It was IU Bloomington junior Dennyz Barahona’s second time in jail that afternoon. An accounting major in the Kelley School of Business from Nappanee, IN, Barahona had big plans for his future. However, ever since he stepped foot into Alumni Hall the afternoon of Jan. 21, life had not been good to him. "I went to go get a job, was told I couldn’t get a job, went to get a house, was told I couldn’t get a house. In jail I get treated pretty rough, this is my second time being here. So my life hasn’t been the greatest,” Barahona said. Luckily for Barahona, it was all a simulation. Along with over 300 other students, Barahona was participating in the IUnity Summit, an event presented by Indiana University’s Cross-Cultural Programming Board and supported by the Office of the Vice President for Diversity, Equity, and Multicultural Affairs. Held on Martin Luther King Jr. Day each year and formerly known as the Unity Summit, the IUnity Summit gives attendees the chance to engage with concepts of privilege, identity, and difference through various activities. "Celebrating Martin Luther King Jr. legacy calls us to examine systemic oppression in all of its forms, and it was so encouraging to see this work on full display throughout the IUnity Summit,” said James C. Wimbush, vice president for Diversity, Equity, and Multicultural Affairs, Dean of The University Graduate School, and Johnson Chair for Diversity and Leadership. “I was particularly struck by how enthusiastic our students were to participate in this simulation and take on the complex topics of identity, privilege, and discrimination. Their insights certainly left me convinced that the work of Martin Luther King Jr. is alive and well." Through this year’s IUnity Summit, participants had the chance to step into identities other than their own through an interactive simulation. As each participant walked through the door, they received a passport guiding them through the day’s events along with a nametag. Instead of the participant’s name, each name tag featured an encrypted series of numbers, symbols, and colors that signified aspects of the identity the participant would assume for the simulation. Using their passport as their guide, each participant then made their way through several stations in the hall, representing points in life such as finding a job, seeking housing, applying for health insurance, or getting an education. Depending on their symbol, however, completing these tasks was not always straightforward. The facilitators at each station would scrutinize each participant’s name tag and treat them accordingly. Some participants were allowed to skip to the front of the line or were approved for the highest grade of housing, health insurance and education, even if they had previous mistakes on their record. Other participants were subjected to unwelcoming or discriminatory treatment based on their identity symbols--treatment that, for some, culminated in the facilitator calling the police. From there, participants would have to face one of several judges, based on the symbols on their nametag, who would determine how long they would sit in the simulation’s jail. While the participants themselves were not aware of what the symbols on their nametags meant, they quickly picked up on the fact that facets of their assumed identities determined how they would be treated. In the second half of the IUnity Summit, participants had the opportunity to unpack the complex emotions they felt throughout this process. Led in a debrief session by Monica Johnson, director of the Neal-Marshall Black Culture Center, participants learned the meanings behind their symbols and discussed their reactions to the simulation with each other. 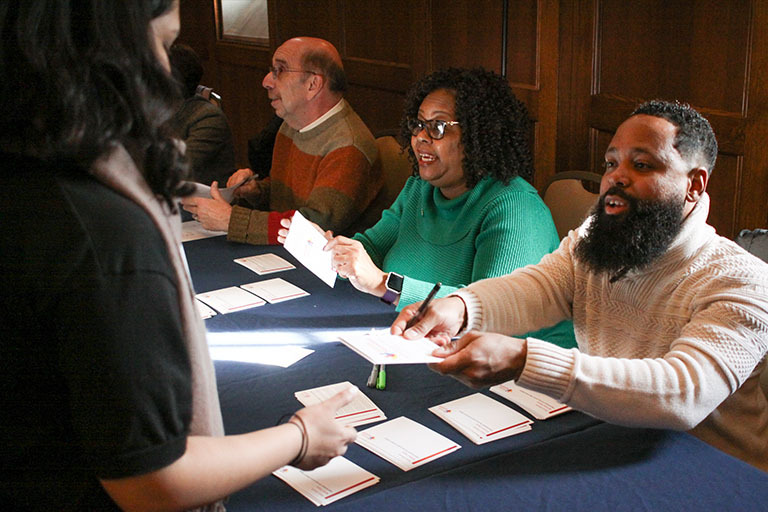 With their name tags including markers for race, gender identity, socioeconomic status, sexual orientation, language proficiency, and degree of police surveillance in their community, participants’ experiences throughout the simulation were nuanced and complex. Some individuals found a sense of freedom after being lucky enough to fall into a number of privileged categories that made their experience easier. Others expressed frustration at the fact that, though they were privileged in some areas, other aspects of their assigned identities made them vulnerable to poor treatment at one particular station. While this experience with discrimination was unfamiliar to some, to other participants, it felt all too everyday. Throughout the discussion, Johnson emphasized the complexity of identity as impacted by systemic oppression--complexity that means everyone has some degree of privilege, and that examining the effects of societal discrimination was incomplete without taking all of one’s identities into account. The participants who were assigned identities were not the only people impacted by the simulation. The activity’s facilitators, who maintained the various stations and were responsible for accepting or rejecting participants, also found themselves dealing with the complex emotions of being in such a position. One such facilitator was Marvin Jones, a doctoral student in astrophysics from Newport News, Virginia. As a facilitator with the employment section of the simulation, Jones felt morally conflicted having to deny people for reasons aligning with systemic oppression. At the same time, the facilitator experience gave him insights on how oppression negatively affects individuals, regardless of how hard those individuals work to overcome systemic disadvantages. After an hour of insightful discussion, Johnson brought the conversation back to the holiday on which the IUnity Summit took place: Martin Luther King Jr. Day. Drawing attention to King’s numerous statements on the intersection of poverty and systemic oppression, Johnson noted that the intersectionality embraced by the IUnity Summit was also central to Dr. King’s message. For Johnson, seeing the summit’s attendees work through difficult conversations of identity, privilege, and oppression first-hand was inspiring. In a time when the national discussion around diversity and inclusion is often fraught, their spirit of pursuing justice and exploring difference left her confident in the change that this, and future, generations will bring. “The IUnity Summit reminds me that the seeds I plant right now have the space to grow, and that growth will be facilitated largely by the students that take part in the IUnity Summit, by the folks who are growing up now,” Johnson said.